﻿ What does Chinese word 饭桶 mean? A Bucket of Rice and A Good-For-Nothing, Which One Are You? As we all know, rice is a very common food in China. We eat it all the time! If you look at the amount of chopsticks we use it to eat every year, you can see it is a staple in our diet and our life. There are many rice paddies in China, and much of our land is used to grow this food. 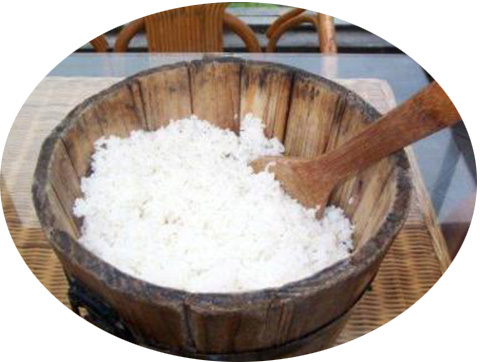 Rice is a part of our daily life and has also become a big part of our vocabulary. That’s why vocabulary surrounding rice in China can have a few meanings. One expression that we may hear in daily life is “饭桶 (fàntǒng)”. In one sense it just means rice bucket. But some people also use it to describe a certain type of person: a good-for-nothing! 饭桶 (Fàntǒng): n. rice bucket; good-for-nothing. Wǒmen yīnggāi bǎ mǐfàn zhuāng zài fàntǒng lǐmiàn. We should put the rice in the bucket. Nǐ néng bǎ nà biān de fàntǒng dì gěi wǒ ma? Could you please pass me the rice bucket over there? Tā jiùshì yí gè fàntǒng, gēnběn bú huì zhàogù biérén. He is a good for nothing and doesn’t know how to take care of others at all. Wǒmen bèi yígè fàntǒng zhǐhuī zhe qù gōngzuò. We were directed to work by a fool. In the cases above, this word was used to be negative or as a joke in a specific context. I try to use it mostly as a joke, since I don’t like to criticize people with such harsh words. When it comes to negative vocabulary you definitely want to be careful and make sure you are phrasing your sentences right so that if you are using it as a joke, the joke is obvious! The following quiz will test you to see if you can discern the meaning of “饭桶 (fàntǒng)” in sentence form. Test your understanding below! 1. Read the sentence below and choose which answer matches with the correct meaning of “饭桶”? Nǐ zhēn shì gè fàntǒng a, zhème jiǎndān de tí dōu bú huì! Ronina Li lives in the Beijing and has been a Mandarin teacher for 6 years. She likes reading and delicious food. She hope she can help more people to learn Chinese language and know Chinese cluture.